Located in downtown Boise, Idaho, JUMP is meeting place for people of all ages to gather, explore and create. EDM developed the feature interactive software as well as the underlying software infrastructure for this dynamic community hub. 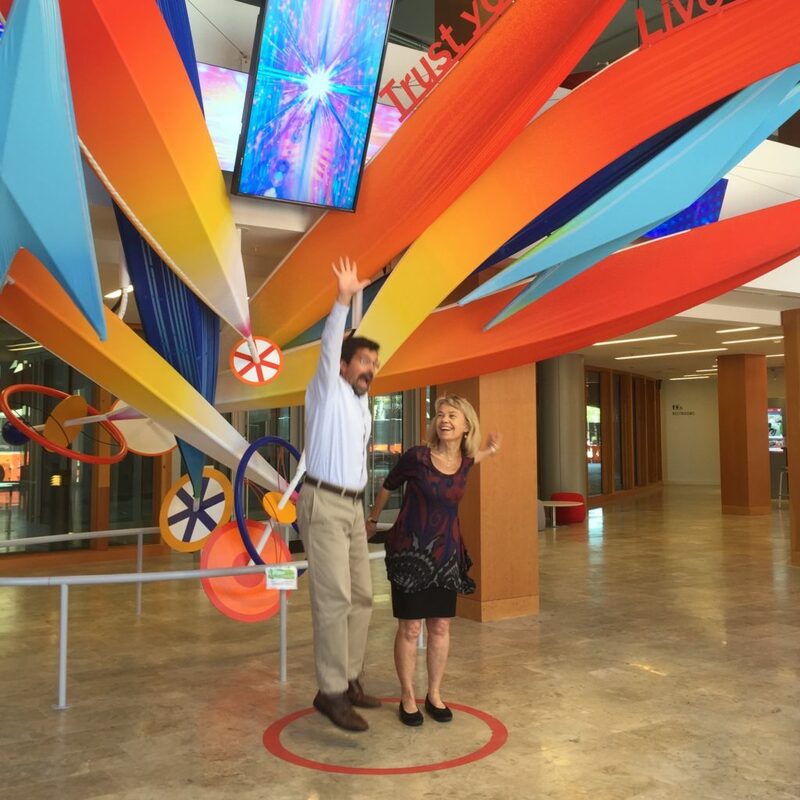 JUMP is a remarkable new community centre located in downtown Boise. 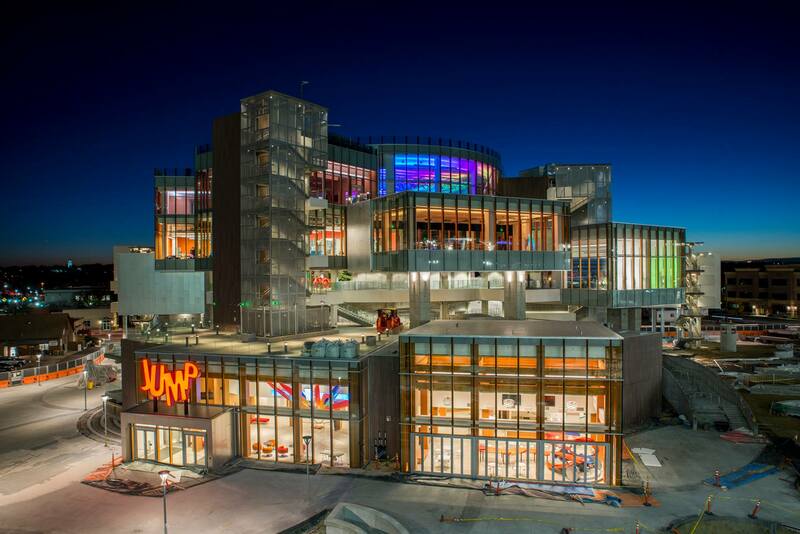 An acronym for ‘Jack’s Urban Meeting Place’ (after Idaho entrepreneur J.R. Simplot), JUMP’s mission is to provide a place for people to discover new possibilities and explore their individual potential. JUMP features a number of large specialized studio spaces that facilitate programs in cooking, dance, multimedia production, maker culture, and more. EDM was JUMP’s primary interactive and software developer. We worked closely with JUMP staff to create the signature ‘showtime’ and ‘jump’ digital interactives. We handled the AV design and software for the biographical “JR Tribute” audio experience in the lobby area. And we both designed and programmed the various information totems scattered around the campus and provided JUMP with a custom CMS that allows staff to easily update content. 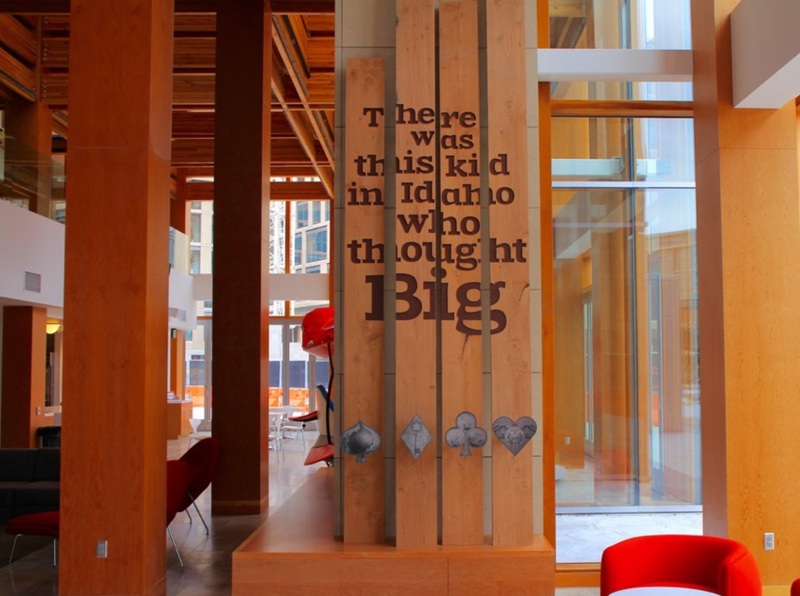 On entering the lobby, visitors are greeted by a large sculpture that incorporates playful agricultural motifs and inspirational quotes. 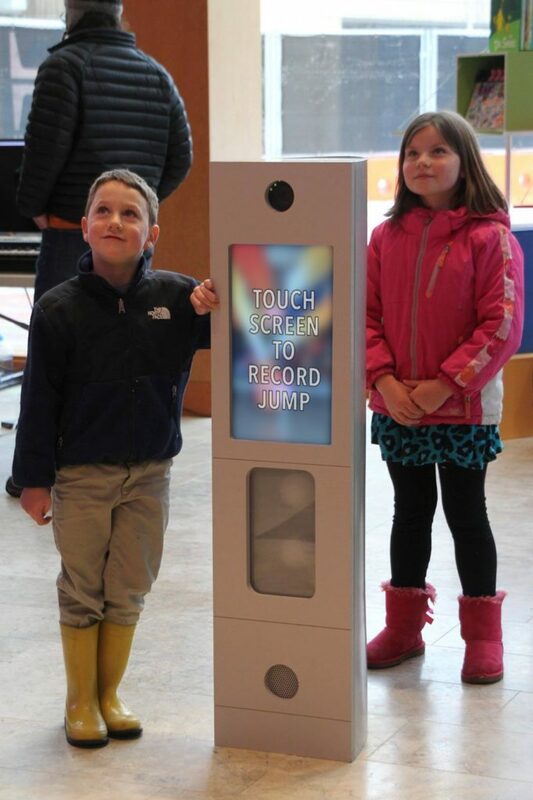 A nearby pedestal with a high-speed camera and embedded touchscreen invites visitors to take a step back and…jump! These freeform jumps are then shown in extreme slow-motion on the screen above the sculpture, accompanied by a choreographed lighting of the sculpture’s leaves and an artful animation on the video wall behind the display. While the experience is simple and easy to do, there is an underlying technical complexity involving high-speed video capture using a Gigabit ethernet camera, coordinated lighting, and network-synchronized HD video playback across an eight-screen video-wall. The exhibit’s custom software even adjusts exposure settings to account for the bright morning sun that washes through JUMP’s floor-to-ceiling east-facing windows. 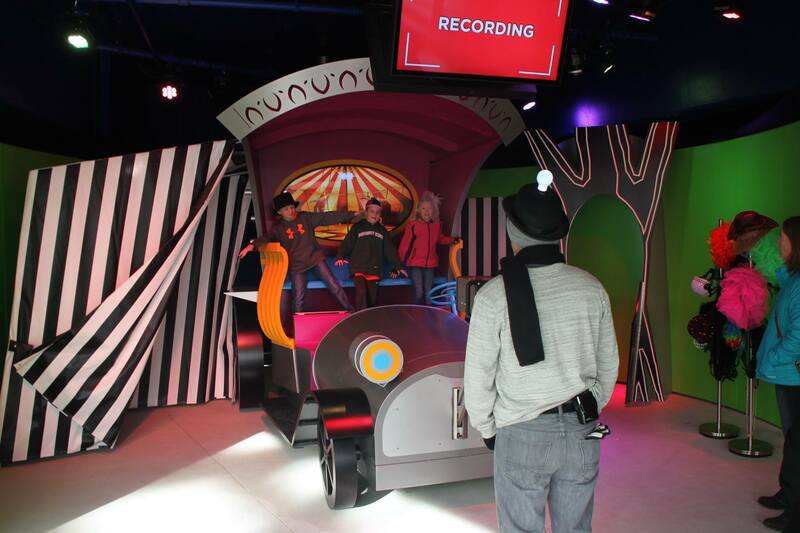 One of JUMP’s feature interactives is the whimsical ‘Showtime’ experience that sits outside of the PLAY multimedia studio. 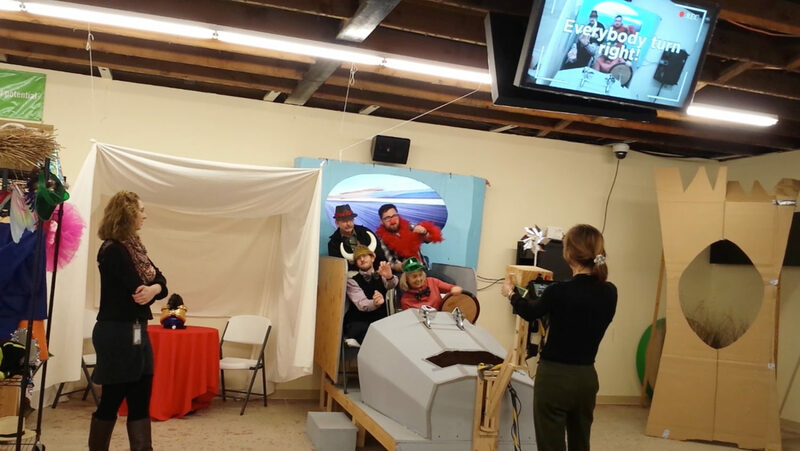 Visitors can play the role of camera operator, or don a costume and jump into Jed Clampett’s Beverly Hillbillies inspired car and act out a series of light-hearted improvisational scenes. Combining programmed lighting, video capture from the moveable camera, compositing and playback with real-time effects, Showtime was developed through extensive testing with staff and community stakeholders. 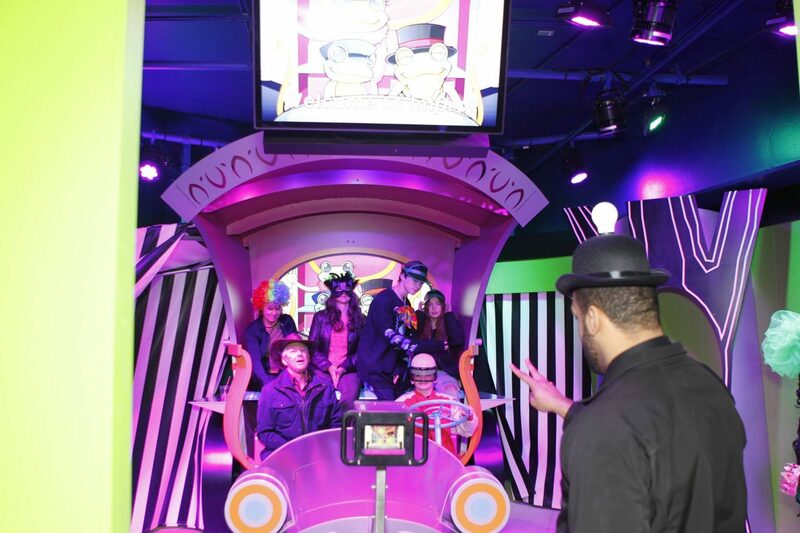 The result is a fun-filled, technologically advanced exhibit that is robust and easy to operate. J.R. Simplot was a dedicated bridge player. 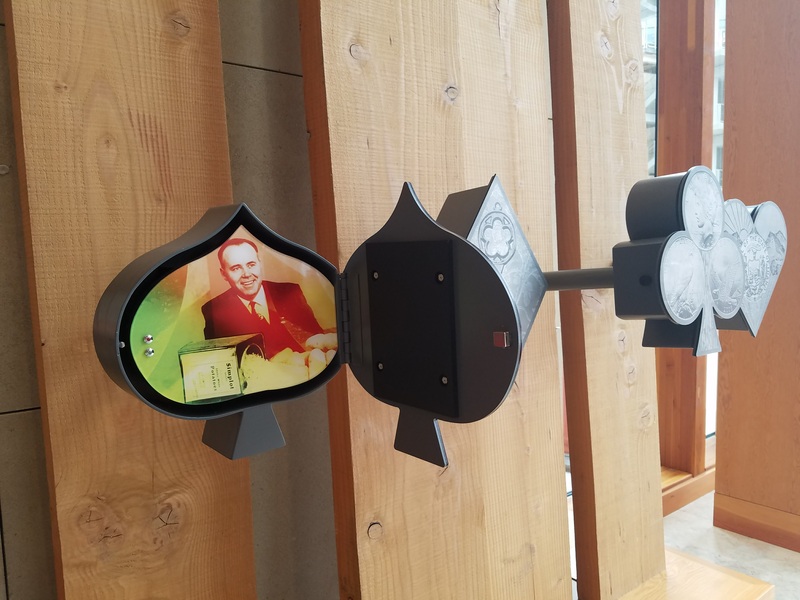 Adjacent to the fireplace seating in the lobby is a subtle tribute to the man in the form of four ‘lockets’ shaped like the familiar playing card suites. Opening a locket triggers a backlit photo and short audio snippet. All content is updatable via the centralized CMS. The JR Tribute exhibit in the JUMP lobby. The information totems outside each studio serve a number of purposes. First and foremost, they act as a digital advertisement for the associated studio. For example, the SHARE kitchen studio totem might show photos from last month’s ‘Children’s Culinary Institute’ program to advertise this regular monthly event. These interactive mosaics of images and video are updated frequently by JUMP staff using the web-based CMS. 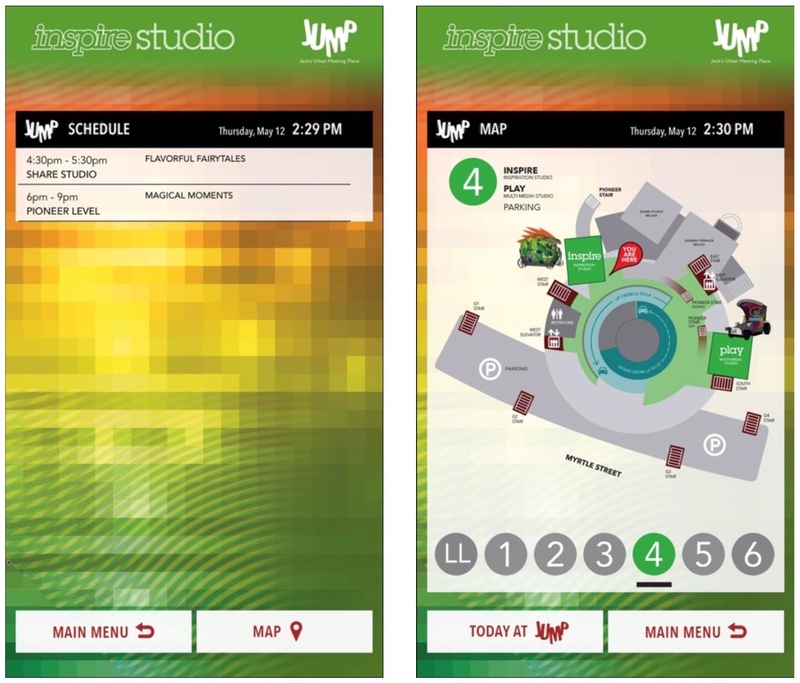 The totems also serve as digital wayfinding, offering an interactive map of the JUMP campus. Finally, the totems provide a daily schedule of JUMP activities, which is automatically extracted from JUMP’s event management system. In order to fully recognize the digital needs of both the JUMP organization and its visitors, EDM worked closely with the Exhibit Team from early in the development phase. Early in the design process we established a JUMP testbed. This dedicated space allowed us to build simple functional mockups of feature interactives for testing with visitors. As an interaction designer, it’s easy to fall into the trap of thinking one can accurately predict the behaviour of visitors. The testbed is both humbling and revealing in this regard: there really is no substitute for observing the reaction of a ‘fresh set of eyes’. In the case of the Showtime experience, the testbed allowed us to experiment with core AV details like the camera rig’s range-of-motion, its field-of-view, and the resulting impact on the visibility of back seat ‘passengers’. While developing content, it let us test script ideas with visitors. In the later stages it allowed us to make small but important changes to scene timing, audio prompts, and special effects. And having a dedicated test space allowed us to carry out simulated 24-hour runs of the software to ensure that the production exhibit would stand up to the expected heavy use on opening day and beyond. 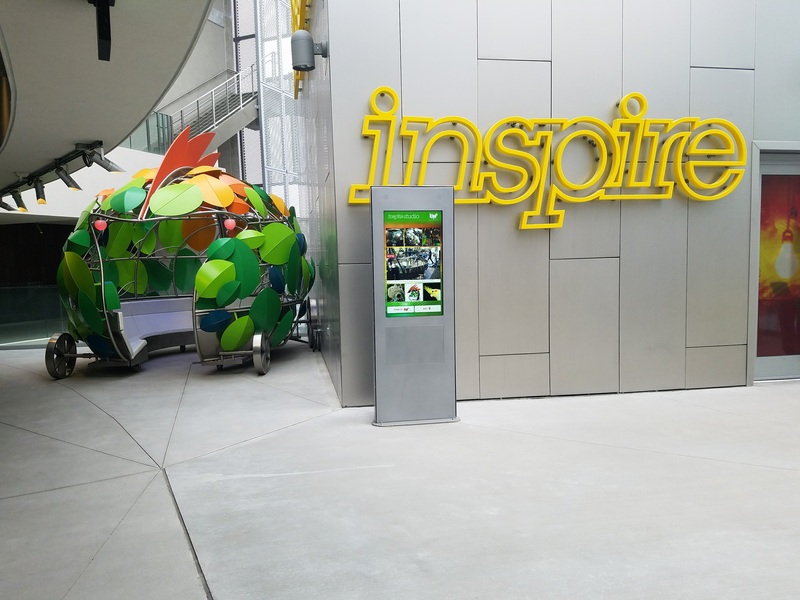 JUMP utilizes EDM’s proprietary Smart Exhibit Environment. 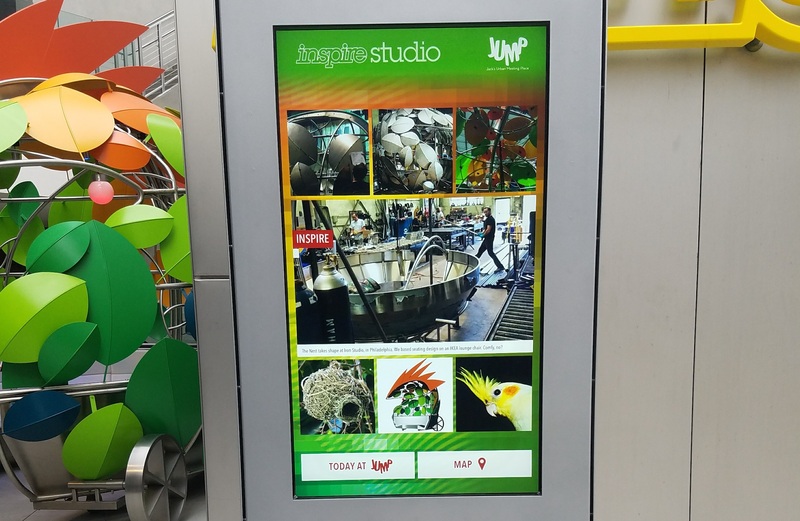 This networked, digital infrastructure enables staff to update day-to-day information and make periodic content changes to visitor-facing interactives. It also provides complete software monitoring and troubleshooting—from a remote desktop computer or from a smartphone while on the floor.